Happy 2019! Here in St. Paul, Minnesota, where the weather has turned chilly, we’re reflecting on last year and turning to our hopes and goals for 2019. In 2018, we explored mindfulness. The focus on mindfulness helped us notice many things—how we showed up in different contexts, where we struggled or made things more challenging for others, and when we were at our best. These reflections made us want to turn our attention, in 2019, to inclusion. Luckily, we’re not alone in this journey—inclusion has become more and more of a focus in our world. To us, inclusion means being intentional, thoughtful, and, yes, mindful that the voices that are heard and shaping the future must belong to those most affected by any decisions made. In our office, with continued all-team engagement in the big decisions we face. For example, staff collaborated at our retreat at the beginning of the year to envision this year. Everyone was invited and had multiple ways to contribute. In our work with community consultants, individuals, policymakers, and families—anyone who is affected by policies or who participates in programs. They tell us what to pay attention to, raise new questions, and help interpret what we’ve discovered to shape next steps. 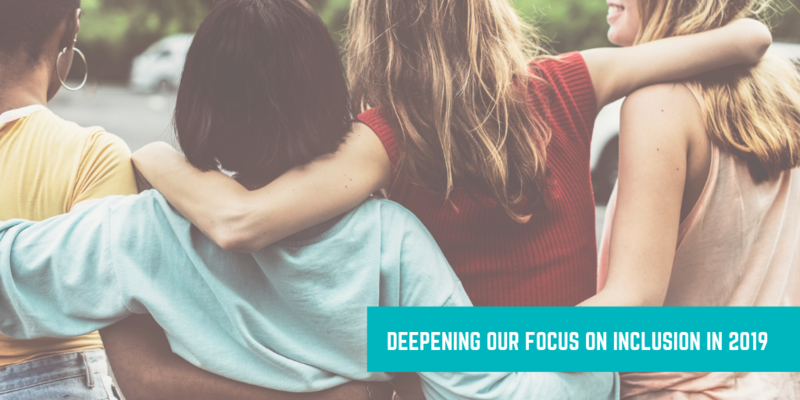 In our communities, by using our new Volunteer Time Off time, committing to pro bono projects, and generally being connected to our communities to learn where we can support greater inclusion. What else should we be looking at? We’d love to hear what lessons you’ve learned or ideas you have! Email me at leah@theimprovegroup.com.